Georgia’s Matt Versola, Austin Lytle and Dylan Holt have done a lot of work outside of tournaments, and it’s paying dividends. Versola won The Masters at McCurry in Fayetteville, Ga., marking the third week in a row a member of the Peach State trio has won. Versola won with an 11-under par 103 while averaging 27 points above his rating over two rounds. Lytle, who picked up a win two weeks ago, finished in fifth with a 3-under par 111. Holt—a winner last week—tossed a two under par 112 to land in sixth. Matt Versola, Austin Lytle and Dylan Holt teaching seniors Disc Golf. The success has come in a month Versola, Lytle and Holt have taken the time to share disc golf with others. They have run a PAR2 Challenge, hosted a clinic, taught the game to a group of seniors and given lessons to locals. Catrina Allen got her second A-Tier win of the year at The Vintage Open in Russellville, Ark., shooting an 11-over par 185. Allen got off to a good start with a 961-rated round one and built her lead over the following to rounds to win by 52 throws. Chris Dickerson saw his 13 tournament win streak come to an end last week at the Jonesboro Open, but it didn’t take him long to make a return atop the podium. Dickerson won the Iffy Hollers Toast to Todd Nashville Disc Golf Store Tour Series in dominant fashion. Jacob Henson celebrating his team's victory at the National Collegiate Disc Golf Championship. Despite two days of chilly temperatures and rain in Middleburg, Ky., Dickerson shot 1040- and 1072-rated rounds to finish nine strokes ahead of second. He finished with a 25-under par 161. The weather was nicer for Jacob Henson and his Mississippi State teammates as they ran away with the National Collegiate Disc Golf Championship team title. 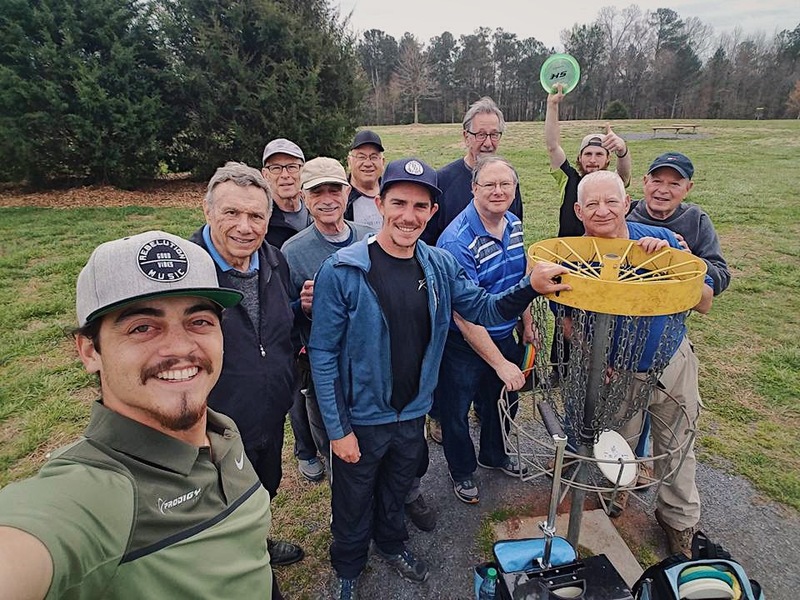 They skillfully played through Dunipace Dunes, Moody Woods and Hogback at the Hippodrome Disc Golf Complex in North Augusta, S.C. to win by 33 strokes with a 59-under par 609 total after six rounds. Henson also played well in the individual championship, finishing in a tie for fifth to secure All-American First Team status with a 3-under par 136. Jennifer McGibbon returned to action to win the Open Women’s division at the Premier Design : 411 Hybrid at Warriors Bend TPC. McGibbon had spent the previous eight weeks in walking boot as an injury healed and made her way back to the course to shoot a 2-over par 130 to win the Kingsport, Tenn., event by four strokes.